Injuries to the upper arm include fractures to the humerus bone, axillary nerve injury, contusions and muscles strains. A humerus fracture is a break in the upper arm bone. This may be anywhere in the bone, from the neck of the humerus near the shoulder to the distal end at the elbow. A form of fracture close to the elbow is known as a supracondylar fracture. There will be instant arm pain from the moment of the injury and medical help will be needed if a fracture is suspected. Symptoms of a humerus fracture include instant pain in the arm at the time of injury. The athlete will have difficulty moving the arm either bending the elbow or raising the arm upwards. There may be deformity of the arm if the bone is displaced. Bruising and swelling are common. In compound fractures, the bone pierces the skin. A fracture is the same thing as a break. The two terms are completely interchangeable. A fracture can be either an acute fracture which occurs due to a direct impact or force or a stress fracture which gradually develops over time. Stress fractures of the humerus are rare as it is not a weight-bearing bone. They are more common in the bones of the legs and feet. A rare form of fracture which is most commonly seen in throwing athletes (e.g. Javelin or baseball etc) involves a spiral fracture to the midshaft of the bone, just below the attachment of the deltoid muscle. 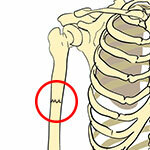 A fracture to the humerus will most often occur as a result of a fall, often onto an outstretched arm. Car accidents may also cause a humerus fracture. Seek medical attention immediately if a fracture is suspected. An X-ray will be ordered to confirm the fracture and assess the presence or amount of displacement. The arm will usually be placed in a temporary cast or splint whilst swelling goes down. A full cast is then fitted 2-3 days later and stays in place for 4-8 weeks. If the two ends of the bone are displaced, or the bone is broken into more than 2 parts, surgery may be required. This will be used to realign the bone and fix the 2 (or more) parts using pins or wires, whilst the bone heals. Injury to the Axillary nerve usually occurs as a result of a direct impact to the outer arm, although it can also be injured following a shoulder dislocation or compression of the nerve. With this injury, there can be numbness on the outer upper arm and there can be difficulty moving it. Read more on the causes and treatment of this arm injury. Numbness over the deltoid muscle on the outer upper arm. Difficulty raising the arm out to the side. Wasting the deltoid muscle in prolonged injuries. Injury to the Axillary nerve may be due to a traumatic injury such as a shoulder dislocation or a direct impact to the outside of the upper arm. In this case, the damage is done to the nerve. Either the myelin sheath (which surrounds the nerve) or the axon (the nerve itself) are injured. This may heal or may cause a permanent disability, depending on the extent of the damage. 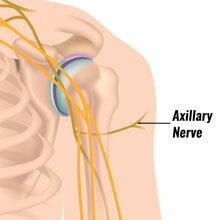 The Axillary nerve may also be compressed which will cause more temporary symptoms. A common example of this is the incorrect use of crutches, especially with the very old fashioned axillary crutches which apply pressure into the armpit. Another condition to be aware of is Quadrilateral Space Syndrome. This occurs when the Axillary nerve is compressed within the quadrilateral space at the back of the shoulder. This is seen in throwers especially. As well as the symptoms listed above, the patient may complain of pain at the back of the shoulder. The patient should be referred to a neurologist. An EMG may be taken to confirm the diagnosis. In most cases, treatment is not necessary as the symptoms will gradually clear on their own as the nerve heals. Anti-inflammatories may be prescribed to ease pain and swelling around the nerve, which helps to reduce compression. Physical therapy may be recommended to maintain muscle strength as much as possible. Timescales vary massively for recovery from this injury. It could be anywhere from 6 weeks to 6 months or more. If symptoms do not clear or the problem gets worse, surgery may be required to further investigate the problem. A tricep strain is a tear to the triceps brachii muscle at the back of the upper arm which contracts to straighten the elbow. This arm injury can be caused by overuse or a sudden force on the muscle. Pain in the back of the arm will usually come on suddenly, which can be helped by rest and ice. 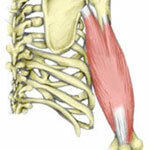 Read on for more about the causes, symptoms, and treatment for a tricep strain. Symptoms include pain in the muscle at the back of the upper arm or the attachment points at the elbow or shoulder. There may be mild swelling or bruising over the muscle. Pain is usually sudden in onset and a small popping or ripping sensation may be felt. Extending or straightening the elbow against resistance is may be painful. Tenderness pressing into the muscle is a symptom and stretching the triceps may also be painful. Injuries to the Triceps muscle usually occur following a sudden force or stretch on the muscle. There is instant pain and sometimes a popping sound or feeling in the muscle. This is not a common injury, although may occasionally occur in weightlifters or sports where rapid, forceful elbow extension is required. It can also be caused by overuse and repetitive strain which weakens the muscle to the point a tear occurs in the fibers. Immediate first aid for a triceps strain should be rest and apply ice or cold therapy. I can be applied for 10 to 15 minutes every hour during the acute stage which will most likely be 24 to 48 hours initially. A compression bandage or arm support should be applied to help reduce swelling. Try to keep the elbow moving gently to avoid stiffening up and once pain-free stretching the triceps muscles should be done. Isometric strengthening exercises can begin with gentle resisted elbow extension. Isometric or static exercises are done without any movement of the elbow. This can be progressed to exercises with resistance bands and free weights when ready. When pain allows strengthening exercises with resistance bands can be progressed. Start very light and build up slowly. If there is no pain during, after or the next day then increase the number of reps or resistance until bench press type exercises and press ups can be performed. A biceps contusion is a bruising of the Biceps Brachii muscle in the upper arm. This occurs due to a direct impact to the area, usually, from a collision or a ball, racket or stick etc hitting the arm. Symptoms can include pain, swelling and difficulty straightening the arm, which can be helped by icing and elevating the injured area. Pain on and after an impact. Pain on trying to bend the elbow, especially against resistance). Apply ice to reduce bleeding and swelling. Elevate the arm and use a compression bandage. Try to keep the elbow moving gently. Once pain-free, gently stretch the biceps muscle to regain full extension. A sports massage therapist may be able to help loosen the muscle. Please note, massage should not be applied within 72 hours of injury.